EDIT Jan 2016: Since this still gets attention. Since asking this I've completed a few AngularJS projects, and for those I mostly used factory, built up an object and returned the object at the end. My statements below are still true, however. EDIT : I think I finally understand the main difference between the two, and I have a code example to demonstrate. I also think this question is different to the proposed duplicate. The duplicate says that service is not instantiable, but if you set it up as I demonstrated below, it actually is. A service can be set up to be exactly the same as a factory. I will also provide code that shows where factory fails over service, which no other answer seems to do. With service, the VaderService injected in to the controller is instantiated, so I can just call VaderService.speak, however, if I change the VaderService to module.factory, the code in the controller will no longer work, and this is the main difference. With factory, the VaderService injected in to the controller is not instantiated, which is why you need to return an object when setting up a factory (see my example in the question). Given this information, I see no reason to use factory over service, service can do everything factory can and more. Then reload index.html (I made sure I emptied the cache and did a hard reload). It works exactly the same as it did with module.factory. So what is the real functional difference between the two?? Factory are a great way for communicating between controllers like sharing data. Cannot be injected in .config() function. If you're using an object, you could use the factory provider. In below example I have define MyService and MyFactory. Note how in .service I have created the service methods using this.methodname. In .factory I have created a factory object and assigned the methods to it. Factory and Service is a just wrapper of a provider. Factory can return anything which can be a class(constructor function), instance of class, string, number or boolean. If you return a constructor function, you can instantiate in your controller. Service does not need to return anything. But you have to assign everything in this variable. Because service will create instance by default and use that as a base object. It just a wrapper around the factory. If you return something from service, then it will behave like Factory. IMPORTANT: The return result from Factory and Service will be cache and same will be returned for all controllers. Factory is mostly preferable in all cases. It can be used when you have constructor function which needs to be instantiated in different controllers. Service is a kind of Singleton Object. The Object return from Service will be same for all controller. It can be used when you want to have single object for entire application. Eg: Authenticated user details. If you use a service you will get the instance of a function ("this" keyword). They are technically the same thing, it's actually a different notation of using the provider function of the $provide service. If you're using a class: you could use the service notation. If you're using an object: you could use the factory notation. 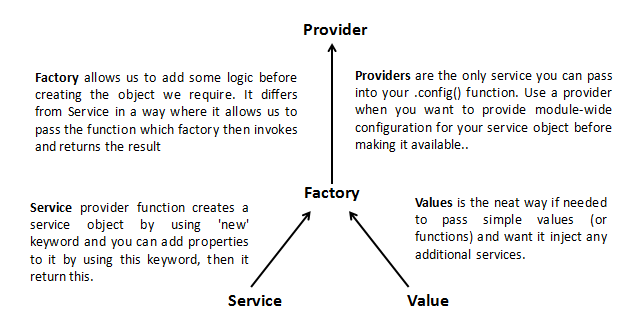 The only difference between the service and the factory notation is that the service is new-ed and the factory is not. But for everything else they both look, smell and behave the same. Again, it's just a shorthand for the $provide.provider function. Should I use factory or service for fetching data in AngularJS? How can I test an AngularJS service from the console?